A retired chief of police, Harlin also served as a deputy assistant director of the FBI. He is a vice chairman of the National Public Safety Telecommunications Council (NPSTC). A frequent participant on committees and speaker at conventions, Harlin received NPSTC’s Richard DeMello Award during RCA’s New York banquet in 2006. An downloadable form offers you the best way to reserve a seat at the breakfast. A reservation is required. Advance payment is $15; payment at the door is $20 — but with a reservation. RCA asks that you download the form, fill it out and mail it in time for it to be received by August 1. 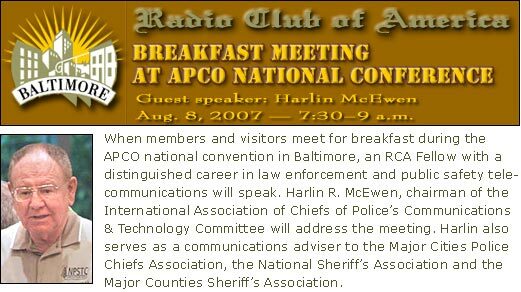 The breakfast meeting is set for the Constellation Rooms E and F in the Hyatt Regency Baltimore, 300 Light St., Baltimore, MD 21202; tel. 410-528-1234. Click the link for a map and directions. Although the subject of Harlin’s talk has not been released, it would be reasonable to expect he might talk about the Public Safety Broadband trust, a proposed licensee for 30 MHz of spectrum in the 700 MHz band. In a joint statement issued together with two other RCA members, Bob Gurss of APCO and Alan Caldwell of the International Association of Fire Chiefs, Harlin responded to legislation introduced by Sen. John McCain (R-Ariz.) on March 1 that would affect how the spectrum is auctioned — tipping it toward public safety, yet almost assuring it would be licensed to commercial operators. The Public Safety Broadband Trust is a hallmark of a proposal put forward by Cyren Call Communications. Speaking engagements at RCA functions have featured several presentations by Cyren Call representatives. At last year’s Spring Gathering, Tamara Casey, a Cyren Call consultant, spoke at a time when the PSBT idea was fresh and controversial enough that RCA felt obliged to publish a statement expressing its own neutrality in the matter. Keith Kaczmarek, Cyren Call’s president, spoke at an RCA dinner meeting last September. If you receive my RCA-related emails, you received a version of Tamara’s remarks and the text of Keith’s. John Melcher, Cyren Call’s vice president of external affairs, is set to speak at RCA’s Texas Dinner on April 17. Regarding Cyren Call’s proposal, AP said Harlin added that he has not seen anyone come up with anything better. “I’ve worked on trying to figure out ways to solve the problem for a long time,” he said. AP said Harlin supports the idea not only because of the additional spectrum, but also because of the private financing aspect. “The big issue is the money. If the federal government doesn’t have to pay for it, that’s a huge relief to the taxpayers,” he said. This entry was posted on Sunday, March 18th, 2007 at 10:24 am and is filed under RCA meetings. You can follow any responses to this entry through the RSS 2.0 feed. You can leave a response, or trackback from your own site.